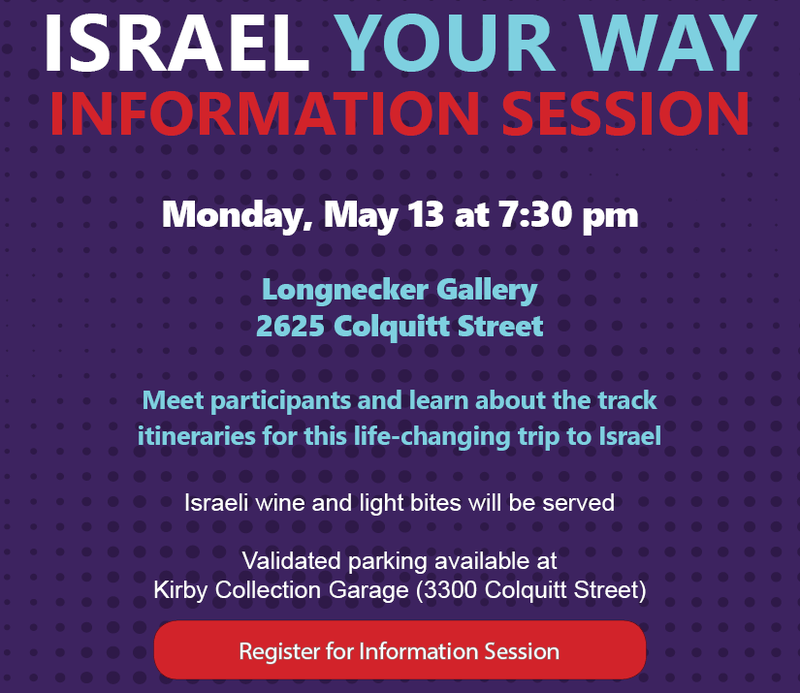 Join the Jewish Federation of Greater Houston on a one-of-a-kind, multi-generational journey through Israel with FOUR CUSTOMIZED TRACKS to choose from. Each journey promises a unique, hands-on and dynamic itinerary that cannot be experienced by most visitors to Israel. ISRAEL IN MOTION: ECO/OUTDOORS - This first-hand experience examines Israel’s cutting-edge, eco-friendly solutions to contemporary challenges while filling you full of adrenaline through action packed outdoor adventures. Build a connection to the homeland and its beautiful terrain in new and exciting ways. START UP NATION: BUSINESS/TECHNOLOGY - Understand how innovation and entrepreneurship is transforming Israel’s society and economy. We’ll meet notable individuals who are leading the charge to keep Israel at the forefront of the technology and business spheres. This inside look will help you understand what makes business in Israel thrive. GOING BEYOND THE HEADLINES: ISRAEL INSIDER - Take a deeper look into Israel and how it functions. Gain new, surprising and multifaceted insights into the Israeli-Palestinian conflict and deeply examine how disputes, including ones over religious pluralism, are impacting the relationship between Israel and Jews in the rest of the world. We’ll meet Israelis striving to overcome disaster and trauma and explore how Israel and Houston can work together to face our greatest challenges. ISRAEL THROUGH YOUR SENSES: ART, CULTURE & CULINARY - Experience the best in Israeli creativity as we meet the people behind the nation’s cultural boom. Delve into the ideas and influences that are shaping the emerging Israeli arts scene. You’ll encounter everything from irreverent Israeli comedy to stunning high-end fashion, and explore new museums, restaurants and wineries as we eat, drink and embrace the richness of Israeli culture. *Contact Suzanne Jacobson at 713-729-7000 or sjacobson@houstonjewish.org to be added to the waitlist for this track. Prices based on double occupancy. Airfare is not included and should be booked by participants. Trip begins the afternoon of Monday, November 4 and concludes the evening of Saturday, November 9 with hotel checkout the following morning. Additional hotel nights available. Minimum household gift $2,400; $1,000 for 40 and under to the Federation's Annual Campaign. The cost of the trip is underwritten by the Velva G. & H. Fred Levine Israel Community Mission Fund.